Voice your opinion! 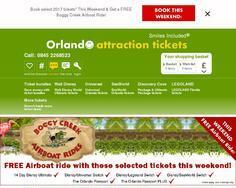 Review Orlando Attraction Tickets now. I am very happy I decided to order tickets from Orlando Attaction tickets. They arrived within two days. Their customer care is really on spot.. The tickets have very reasonable price and I am certain I will be using Orlando attraction to order tickets again in the future. Very good and competitive representation. Is Orlando Attraction Tickets your company?